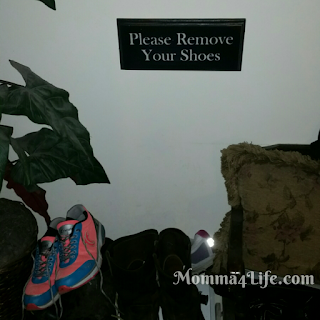 I am loving this Please remove your shoes wood sign it is really nice we have a spot right beside the door where we put our shoes so hanging it there is perfect. 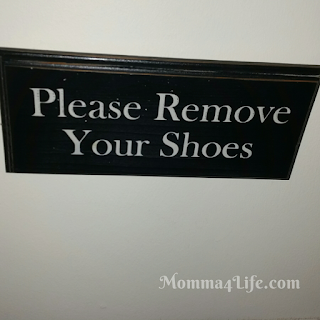 This is a black sign with white lettering very simple and to the point. Don't worry you will get lots of compliments on this sign it gets the point across when you have new guests in your home. This sign is handmade and the dimensions of the sign is 11.5" x 5" x .75" this sign is solid cedar wood very high-quality. This would be a great gift for a housewarming party. If you are looking for a great housewarming gift or even Christmas is coming this would be a great gift for someone and really anyone. This comes with the hanging brackets to hang on the wall or put it against a shelf. This sign is perfect I love it and it's made of good quality.